After more than a month and a half in Japan, I can say without a doubt that soba is one of my favorite Japanese dishes. Whether cold or hot, these delicious thin noodles are great. Also, what many do not know is that the word “soba” means buckwheat in Japanese, in fact, these noodles are usually made 100% buckwheat flour (although there are also mixed with common wheat). These noodles, in their hot version, are usually served in a bowl of broth accompanied by different toppings that can change according to the season. 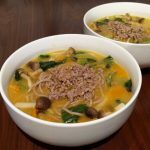 As I am a lover of autumn (which is the current season in Japan), I have used the food of this season to create this excellent recipe for fall soba. It is a recipe that is easy to make and has a unique flavor. Especially recommended for cold days. If you want to make the vegan version of this recipe, you would only have to change the 240 gr of meat for 1 cup of cooked beans. Phase 1 Serves: 2 Prep Time: 20 min. Cooking Time: 40 min. Peel the kabocha squash, sweet potato, and carrot and wash the rest of the vegetables. Cut the kabocha squash, sweet potato and carrot into similar pieces, approximately 1 cm each; cut the leek into slices; cut the pak choy into strips; eliminate the root of shimeji mushrooms and separate them from each other. In a large pot, put to braise the pork with tamari sauce, 3 or 4 tablespoons of broth, 1 clove of whole and peeled garlic and ground ginger. Leave to cook for 10 minutes and preserve. In the same pot, leave the garlic clove, and add the leek, the kabocha squash, the sweet potato, the carrot, and the broth. Cook at least 15 minutes covered, over medium heat. Add the remaining vegetables and adjust salt. Leave to cook 15 more minutes. 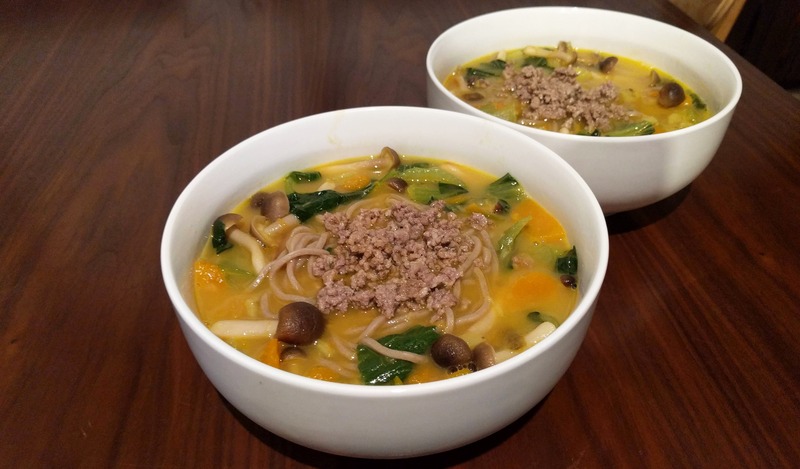 When the vegetables and broth are ready, put the buckwheat noodles already cooked in two large bowls, distribute the vegetables in the bowls and cover everything with the boiling broth. Add the meat on top and serve. 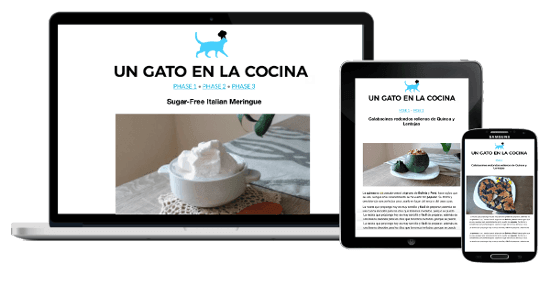 This recipe is suitable for Fast Metabolism Diet Phase 1 – FMD P1. With these quantities, you get 2 protein servings, 2 grain servings and 2 veggies servings for <20 pounds. *If you can't find 100% buckwheta noodles, you can use other P1 grain noodles, like brown rice noodles . - **If you want to make the vegan version of this recipe, you would only have to change the 240 gr of meat for 1 cup of cooked beans.